Beethoven wrote his Piano Trios, Op No. 1 in D Major, known as ‘the Ghost’ and Trio No. 2 in E Flat Major, 0p. 70 during a stay at Countess Marie von Erdödy’s estate, and dedicated both to her for her hospitality. They were published in 1809. One of Beethoven’s most famous piano students, the composer Carl Czerny, wrote in 1842 that the second movement of the Piano Trio in D, the Largo Assai, reminded him of the ghost of Hamlet’s father. In fact, evidence from pages of Beethoven’s notebook suggests that the composer was discussing an opera of Shakespeare’s Macbeth with the playwright Heinrich von Collin at the time, and the words ‘Macbett’ and ‘Ende’ appear near sketches for the Largo of the trio. So the ‘Ghost’ movement was in fact possibly meant for the scene of the three witches in Macbeth. At any rate, Czerny’s nickname stuck. To off set the ‘Ghost’ movement further, Beethoven composed the outside movements to be shorter (each about 6 minutes long) and much more direct in style and character, giving the whole trio an arched shape. Schumann wrote his first two trios, Op. 63 and Op. 80 in close succession despite the large gap between their opus numbers. They were both written in 1847, a remarkably productive year, considering that it was full of turmoil and shocks: the sad death of the Schumanns’ sickly 16-month-old son Emil, and the sudden and unexpected deaths of Felix Mendelssohn and his sister Fanny. 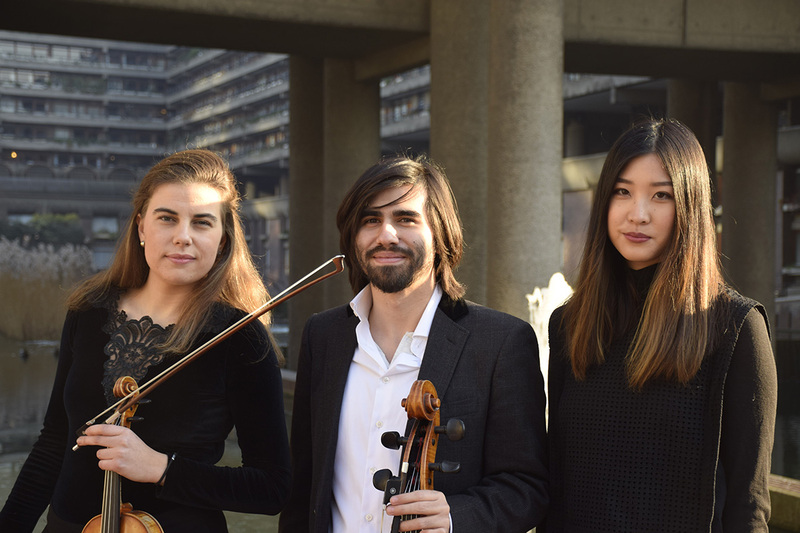 The second piano trio is more effervescent and cheerful in mood than the first trio – the composer himself said that it makes a ‘friendlier and more immediate impression’ than its predecessor. Antonin Dvorak’s Piano Trio No.4, also known as the Dumky trio, was completed on 12 February 1891, shortly before he left his native Bohemia, moving the United States. As in many of his compositions and following the nationalist example of Bedrich Smetana, Dvorak employs many aspects of traditional folk music in the trio. The structure is notable as being a rare example of a strong deviation from the typical sonata form used in the 19th century. Dumky is the plural form of dumka, a term introduced into Slavic languages from Ukraine, literally meaning ‘thought’. Originally, it is the diminutive form of the word duma (plural ‘dumy’), which is a sung, Slavic epic ballad, generally thoughtful or melancholic in nature. Essentially, by classical standards, the structure of the trio is free, but composers from many Slavic countries began using the duma as a classical form to indicate a composition of a dark and brooding nature with cheerful sections interspersed. The trio was premiered in Prague on April 11, 1891 by the violinist Ferdinand Lachner, cellist Hanuš Wihan, and Dvořák himself on the piano. It was so well received that he performed it on his 40 concert tour of Moravia and Bohemia before he left to direct the National Conservatory of Music in New York. It was published while he was living in the USA and proofread by Johannes Brahms. Kathy Chow, from Melbourne, Australia, graduated with first class Honours in piano performance at the Melbourne Conservatorium of Music. In 2014 Kathy won first prize in the Boorandara Piano Concerto Award with her performance of Rachmaninoff’s Second Piano Concerto; in 2015 was the winner of the Music Society of Victoria’s Hephzibah Menuhin Competition; and in 2016 was a finalist in the Sydney Eisteddfod Allison/Henderson Piano Scholarship, among many other awards. Kathy has just completed her Artists Masters in Performance at the Guildhall School of Music & Drama under Martin Roscoe. Kathy plays All Saints’ vintage Bluthner piano, a characterful instrument, though due some loving attention – contributions gratefully received. Lucia Veintimilla, born in La Mancha, Spain, started playing the violin at the age of four and finished her degree at the High Conservatory of Asturias with First Class Honours. She also combined these studies with her bachelor degree at the Guildhall School of Music and Drama, where she has just completed her Artists Masters in Performance. Lucia is a founder member of the Silk Street Sinfonia and The Barokers, touring extensively to major concert halls in UK, Europe and Asia. Lucia is currently the recipient of The Elizabeth Sweeting Award, The Wolfson Foundation 2014 Instrument Award and the British-Spanish Society Centenary Award 2016. She plays a violin built in 2014 by the renowned Spanish luthier, Roberto Jardón Rico. Sebastian Kolin began playing the ‘cello aged seven, studying with Tim Wells at the Royal Academy of Music, then with Naomi Butterworth and Melissa Phelps. When aged 12, Sebastian won a place and bursary to study at the Yehudi Menuhin School Cobham under Thomas Carrol, Charles Watt and Marie Macleod, with the opportunities to play at prestigious festivals such as the Reims Festival, Menuhin Festival in Gstaad, Bath Festival, Bradford Delius Festival and City of London Festival. Sebastian has performed across Europe, including France, Germany, Spain, Italy and Poland, with television and radio appearances in Switzerland, as well as at all London’s major venues – now including All Saints Kingston. Sebastian plays a Viennese ‘cello of around 1880, maker unknown.